Last January, 27 th, I managed to get one of my best halodisplays during my long observation period of halos - I have observed these phaenomena more than 15 years already. On my way home from work I observed 14 different haloforms within 1 and a half hour (14:15 - 15:45 CET). It started with a bright circumzenith arc, sundogs and a clearely vertically elongated left hand side 120° parhelion on a short parhelic circle. 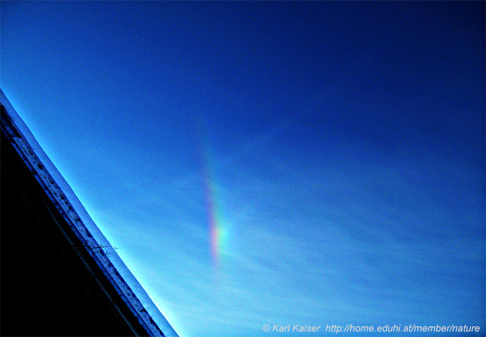 Later the 120° parhelion on the right hand side appeared. The highlight (about 15:15 CET) was the observation of the CZA, supralateral arc, 46° halo, suncave and sunvex Parry arcs, upper tangent arc, 22° halo with sundogs, Tape arc, helic arc, subhelic arc and a little bit later a small part of the left infralateral arc. I run a simulation with Halosim from L. Cowley and M. Schroeder that shows the halos I have observed near the sun quite good. A report and many images can be seen by clicking the image above. I invite you to take a look at the site. I have difficulties to figure out this display, especially the subhelic arc. Sometimes I think that it is just parhelic circle. The simulation is not much help. It is should be centered on the side, rather than on the sun. Thats just amazing Karl I like that tape arc and the subhelic arc. I've seen helic wegener arcs in cirrus back in 2006 but in 09 I got wegener three times and in the one display I got my first tricker arc. Parhelic circle should be seen symmetrically in the images with vertical symmetryaxis. My camera was in a horizontal position as we see (look at the trees in the middle of my image - http://home.eduhi.at/member/nature/met/HALO/phaen2010-01-27/35komb.htm). In my pics subhelic arc stretches from right hand side up to left hand side down. I remember the height of the trees was much more than the elevation of the sun. In 2 hours, on my way to work, I check it out. Ok, Karl, yes, I believe now! A great display! I measured the height of the spruce you see in the image mentioned above - it´s about 22°. The subhelic arc was located much higher in the sky!